Thanks for contacting me about how to start a new soccer club. I did it. You might be able to do it. I started the Fargo Soccer Club in 2007 with 4 players. As of January 13, 2014 the club had 23 competitive teams with over 300 players and 74 recreational teams with over 700 players. In that time the club has won many state championships, numerous other tournaments and had one player selected for the US Club Soccer id2 program and a try-out for the national team. We have had dozens of kids selected to play on ODP teams. Most importantly, we have served many kids who have had a lot of fun playing soccer. National Affiliation You need national affiliation so you can (1) play other teams who are part of a national affiliate, (2) have your rights to play protected and (3) have liability insurance. All youth sports in the USA are over-regulated and overly complicated. Thank you attorneys of the nation. Regardless, it is a fact of life. US Youth Soccer is the largest national affiliate and my least favorite. US Club Soccer is the best competitive national affiliate. USSSA Soccer is both a competitive and recreational national affiliate. SAY Soccer is both a competitive and a recreational national affiliate. AYSO is another national affiliate focusing solely on recreational soccer. I used to register my recreational players with SAY Soccer but for 2 important reasons switched them to USSSA Soccer. USSSA Soccer is the least expensive rec soccer alternative. 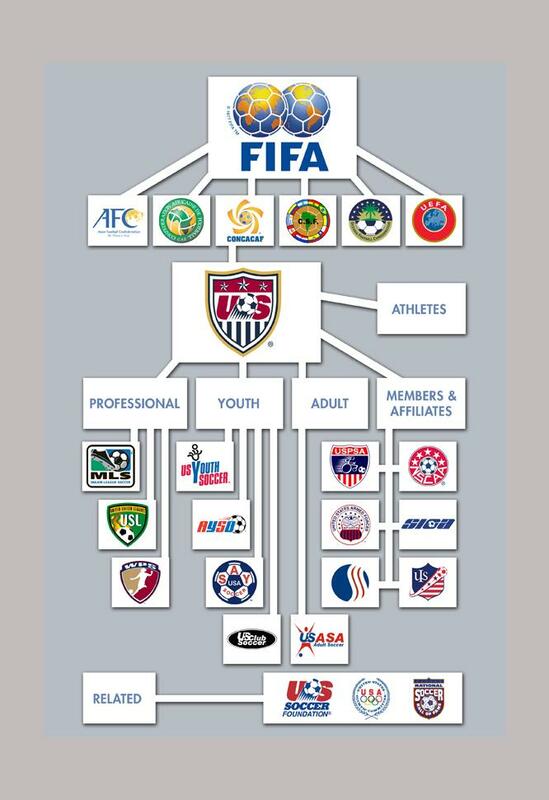 All of these national affiliates are subordinate to the US Soccer Federation, part of CONCACAF, part of FIFA. There are other affiliates under which limited youth playing opportunities exist. See the diagram below. I highly recommend you affiliate your rec program exclusively with USSSA Soccer and dual-register your competitive program with US Club Soccer and, if necessary, the State Association of US Youth Soccer. More on this later. What you decide is based more on interplay opportunities with existing clubs and teams in your area than on any other factor. Protecting your rights to play are very important. I successfully "sued" some of the local soccer authorities and won a national grievance in 2008 just so I could have players in my club play against other youth in local leagues. Without national affiliation you might not get to play any team outside of your club, protect the rights of your players and coaches or easily obtain insurance. Most national affiliates will charge you between $8 and $22 to register a player. This fee will get them insurance and affiliation rights. It is worth it. Do it. Teams To Play Against One of the first things you should look at is the location and affiliation of existing clubs in your area. With very little doubt, your new club will offend an existing club or a number of existing clubs. Crazy. The same people who say they are only interested in the welfare of kids will immediately try to thwart your every attempt to start a club and offer an alternative to their club. They are offended that anyone would think there is a need for another club. Most take your existence personally. That's what happened to me. It could happen to you if there are existing clubs in your service area. I tried to 'get along' with the existing clubs. You should, too. Give if your best shot. If you can't make it work, then consider starting your own club. If the teams/clubs in your area are all rec teams and you want to play rec soccer against them you might have to be part of the same national affiliate. However, rec soccer is generally considered 'in-house' soccer so you should only have to build your own program and have your teams play against one another. If that is the case, affiliate with SAY Soccer. If you want to play against their rec players, you still might not be allowed if they only play 'in-house' in their own club. But that is only true if their rec players are all residents of the same State (This is a complicated issue so contact me for details). That is their right. If they interplay with other clubs, then you have the right to play in the same league under most circumstances. It mostly depends on geography. They can't discriminate against you unless your club is a distance away or you adhere to weird rules that they don't want to follow. If you are in the same geographical area and agree to play by their rules, they pretty much lave to let you play. If they don't, contact their state association or national affiliate and state your grievance. If that doesn't work, consult with your national affiliate for help. If you want, contact me. I will charge you $100/hour. If you want to play competitive soccer, then you have entered a different world. This is generally called traveling soccer. Most competitive soccer is under the supervision of US Youth Soccer but more and more is coming under US Club Soccer. Regardless, you should join US Club Soccer. US Club Soccer makes competitive soccer fun and easy. The best clubs in the country are registered with US Club Soccer. If you only want to play in tournaments, US Club Soccer is the only national affiliates you will need to join. The only tournaments you won't be allowed to play in are "closed" tournaments, e.g.. State tournaments. Any tournament that allows teams from other states or countries are generally open tournaments. US Club Soccer also has league play but most league play is conducted by US Youth Soccer. If you want to play in leagues, you will probably have to join the State Association affiliate of US Youth Soccer. This can be painful and expect some resistance. Ultimately, you will need to register a minimum number of teams and obey some rules that are seemingly only meant to harass you. Even US Club Soccer and SAY Soccer require you to register a minimum number of teams. Once you are part of the national affiliates of your choice, you will be able to play in both leagues and tournaments. You will also find it difficult to host tournaments if you are only a part of US Club Soccer. There are currently issues with some USYS State Associations who don't want to 'play nice' and recognize the existence of US Club Soccer clubs. These State Associations will not allow their member clubs to play in US Club Soccer tournaments using their player cards or insurance. This will stop most clubs from participating. This is the ugly side of youth sports. One of two things needs to happen. First, a bylaw/rule change could put an end to this. Second, a grievance might need to be filed to make US Youth Soccer comply with existing bylaws. Available Fields If you have no available place to play, go find some. Some communities have plenty of soccer fields. Some have none. Some have plenty of green space, i.e.. grass but don't designate it for any purpose. You might have to rent fields from your local park district, schools, existing private fields, baseball clubs, etc. Do what it takes to get fields. In areas where real estate value is high, there may be little or no space for another youth athletic club. My hometown, Fargo, has lots of available green space and we pay approximately $9/year/player to use it. Available Goals and Nets If you don't have goals and nets available, you can start with cone goals. For competitive soccer, you will need real goals and nets. Even for rec soccer, you will eventually need real goals and nets. Our local park district provides the larger, more expensive goals and nets as part of the field rental fee. My club started off getting used goals and nets from a club 250 miles away. We eventually built up our bank account large enough to afford some $100 goals and nets for our rec program. We bought them from SoccerOne.com. We also used PUGG goals for indoor soccer. You need to budget for goals and nets. Field lining equipment or some way to get fields lined Our local park district lines fields for our use as part of our field rental fee. We also own a cheap field liner - $100 at SocerOne.com - that we use to paint fields when we need to. A website to organize your club Without any double I recommend LeagueAthletics.com. There are lots of website solutions but nothing compares to LeagueAhtletics.com. For the money, you will get more functionality than any other product. You will also need to get a merchant services account so you can accept credit card payments. Parents willing to volunteer You will need coaches and parents make the most reliable coaches. You will need help setting up fields, recruiting players. Parents make it all happen. Players Just because you do the work to set up a soccer club, don't think players will beat your door down to join. You have to offer something better than your competition (existing clubs). Perhaps it is cost. Perhaps it is better programs. Perhaps it is better coaching. There are secrets to getting players. In short, you need to market your club with creative ideas. Distribute fliers. Create mailing lists and email list. Use them. Spread the word mouth-to-mouth. Legal Status You will probably need to incorporate, file tax returns, etc. Once you start taking people's money to run a program, you will need to file with your Secretary of State, open up a bank account, etc. Consult with an attorney. Operating Procedures You will need bylaws, rules and procedures to run your new club. You can use any workable set of bylaws and rules. You can borrow mine and make it custom fit your new organization. You can probably find dozens just be searching the Internet. I hope this FAQ helps you start a new soccer club. The work is just beginning.